The U.S. stock market took a huge dip Monday morning, as the Dow Jones industrial average fell more than 1,000 points right after the opening bell rang on the Wall Street trading floor. Although much of the losses were quickly recovered by noon, the market was still not having a great day. These troubles didn't come out of nowhere — they're directly linked to China's unstable market. The country's stock market has been a roller coaster since June, causing international prices for commodities like oil, gold, and copper to decrease, which affects the rest of the world's markets. 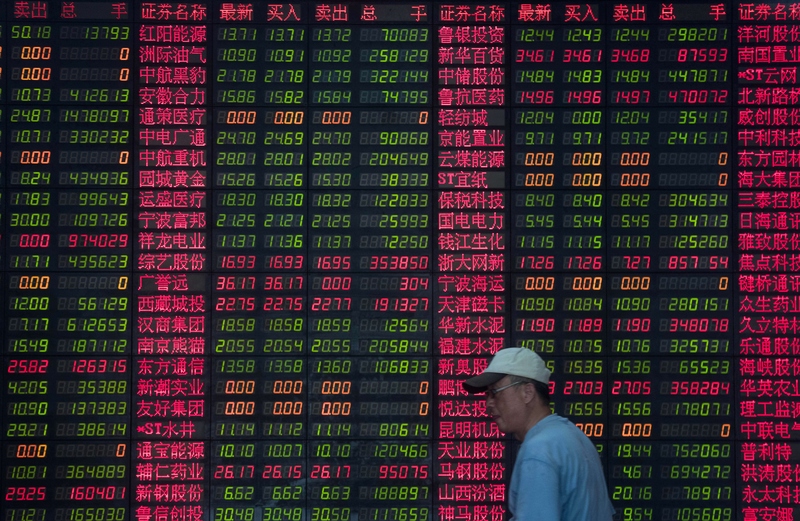 But why are China's stocks falling? Shanghai's stock market has lost almost 40 percent of its value since June 12, and has been extremely volatile the past few weeks. Essentially, China's economy is experiencing a slump, and its stocks hadn't been reflecting that reality. China's factory activity fell to a six-and-a-half year low in August, and less work for factories leads to less economic growth for the country as a whole, because a major industry is shrinking. China has a minimal goal to achieve seven percent economic growth over 2014, as the country wants to improve its economy each year. But it's struggling to get there. He Fan, chief economist at the Caixin Insight Group, told The Wall Street Journal that this indicates "that the economy is still in the process of bottoming out." China's slowing growth comes from slumps in domestic demand, global demand for its exports, and its property market. At the beginning of the year, average people in China, including grandmothers and college students, were making a lot of money from trading stocks, as the market was doing really well. "China's stock market had become detached from the reality of China's own economy, and appallingly overvalued," Patrick Chovanec, managing director at Silvercrest Asset Management, told CNN. Analysts believe that China's market is now correcting its valuations to more accurately echo the current state of the economy. The Chinese government is worried that decreasing stock values will hurt the economy even more, if it leads to people shopping and spending less because they lost money on their shares. In July, Chinese brokerage firms began buying shares, new share listings were suspended, and the central bank cut interest rates, all in an attempt to stabilize the market. These initiatives don't appear to be working, though, as the benchmark Shanghai composite index closed 8.5 percent lower than its initial 3,500 points Monday, dropping to a five-month low of 3,210.80. The U.S. isn't the only country affected by China's unstable stock market. European stocks also fell sharply on Monday, as the main indexes closed five percent lower. According to The New York Times, global stock values have decreased by about $10 trillion since June. China's slowed economy and subsequent falling stocks are having very expensive international consequences.